Want to visit a Tennessee winery with a country music connection? 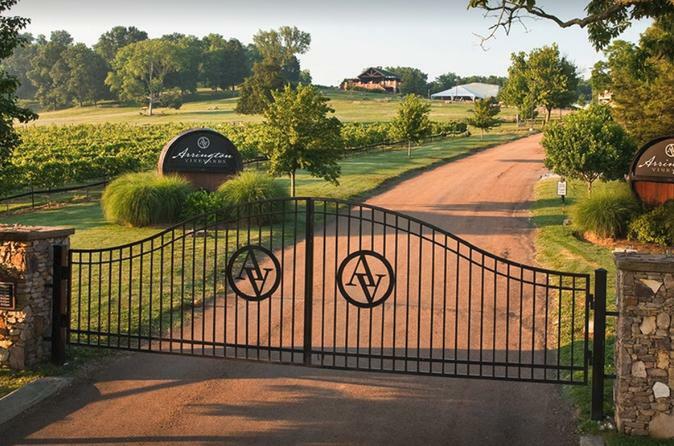 Let Barrels of Fun Nashville take you to Arrington Vineyards. You will have an amazing time at country music star Kix Brooks' award winning winery. Sip wine in the beautiful rolling hills of the Tennessee countryside where you can purchase (at your expense) tastings, tours, pairings or bottles of wine to enjoy on site. Drink from a wide variety of award winning reds and whites, including a Kix signature KB Cabernet. Book now and let Barrels Of Fun take you there. premium round trip ONLY Transportation: $40 Seats fill up fast, book today! Available for Purchase from Winery, Picnic tasting, Pick four wines of your choice upon arriving at Arrington winery and enjoy! Arrington will be happy to open the bottle for you and provide glasses to enjoy your tasting.